From the town of Glandieu, a nearly 2km ascent meant climbing out of the thick fog and into a sunlit Bugey, which are the mountains immediately to the east of Glandieu. As the cold mist parted, the sun revealed the entrance to an elevated plateau surrounded by ice covered crags and snowy peaks. It was in the Bugey that I lost myself on countless small farm roads, rolling up short steep climbs and twisting back down into ancient mountain villages, well off the beaten tourist path. Though sunny and clear, the moderate elevation meant cold. Ice and frost were abundant and shaded areas were truly frigid. But every chilling dip into a small cold valley was followed by a short but significant effort that helped maintain body temperature. Honestly, it was awesome. The sun was shining and I was cycling in France. 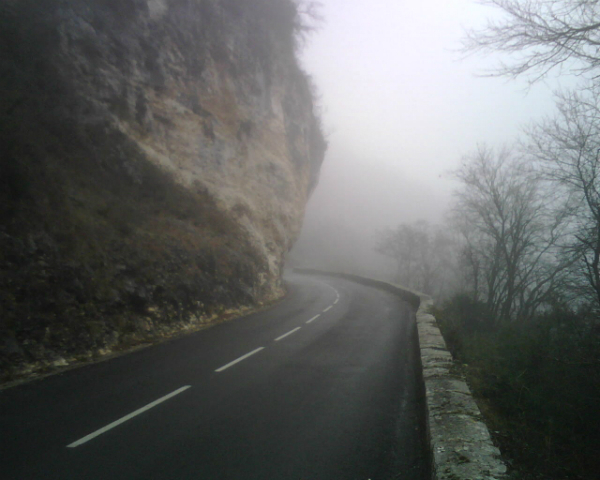 For the most part, I had been trying to dead reckon my way north through the center of the Bugey. I had somewhat studied a map before I set off into this region unknown and I even brought a map with me on the ride. However, I was reluctant to stop, mostly because I was having too much fun rolling around in unfamiliar territory. Initially, I had not gone quite far enough east toward St. Bois. By trying to go north too soon, I had gotten on to a series of dead-end roads. It was more than alright, though. I had food in my pockets, water in the bottles, a little money in my pockets and I was completely stoked to be riding in France again. It was in 1990 that I lived and raced my bike in Brittany. Back on that trip, I arrived in Quimper in mid-April and stayed until the end of October. I had always thought I’d come back to France to ride more, but I never imagined that it would take 17 years! Stoked though I was to be back in France, I was aware that the day wouldn’t last forever. I was just about to stop to refamiliarize myself with the map, when I saw a sign directing me to St. Bois. Once there, the road flattened significantly. It was nice to just let the bike roll at steady tempo through the small towns of Conzieu and Crapeou as I made my way north toward the base of the next climb at Appregnin.